On Friday, the day Waxman-Markey passed the U.S. House, another significant legal development took place — one that may also bear on climate change. President Lula of Brazil signed a bill providing legal title to squatters on Amazon land. 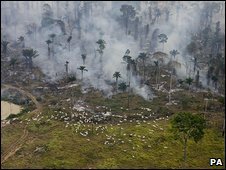 Opponents argue that it will spark speculation in Amazonian property and increase deforestation.